Director – Johannes Roberts, Screenplay – Ernest Riera & Johannes Roberts, Producers – James Harris & Mark Lane, Photography – Mark Silk, Music – tomandandy, Visual Effects – Outpost VFX (Supervisor – Mark Gregory), Production Design – David Bryan. Production Company – Dimension Films/The Fyzz Facility/Dragon Root/Flexibon Films/Lantica Pictures/Tea Shop & Film Company. Lisa and her sister Kate are on holiday in Mexico. Lisa confesses to Kate that she split up with her boyfriend Stuart because he thought she was not adventurous enough. The girls meet two guys in a bar who persuade them to come on a shark cage dive with them the next day. Lisa is fearful but Kate persuades her that Stuart cannot call her unadventurous after that. The next day they set out and cautiously enter the cage in scuba gear where they are winched down only a few meters. However, the winch cable snaps and the cage plummets to the sea floor – 47 meters down. Panicking, the girls try to figure out what to do before the hour of air they have left in their tanks runs out. As the crew back on the boat endeavours to rescue them, the girls must also deal with the threat of prowling sharks. 47 Meters Down was the ninth film for British director Johannes Roberts. Roberts has been a regular genre director with the likes of Sanitarium (2001), Alice (2002), Darkhunters (2004), Hellbreeder (2004), Forest of the Damned (2005), F (2010), Roadkill (2011), Storage 24 (2012), The Other Side of the Door (2016) and The Strangers: Prey at Night (2018). This film started out originally entitled 47 Meters Down and cycled back and forward between that and In the Deep (apparently on the assumption that Americans would think the metric system is somewhere in the realm of watching a film with subtitles – renaming the film 154 Feet Down just doesn’t quite have the same ring) and a VOD/theatrical release. The killer shark film has become so prolific in the last few years that the genre has sought refuge in self-parody – look no further than Sharknado (2013) and the whole host of absurd killer shark films that appeared in its wake. The unexpectedly good The Shallows (2016) was one recent effort to turn the tide back and reconceptualise the killer shark film as a gripping survival drama. Before that you could also point to Open Water (2003), which likewise featured a scuba-diving couple abandoned in a sea filled with sharks. 47 Meters Down feels that is has been conceived in the same vein as The Shallows, if not having drawn direct inspiration from it. 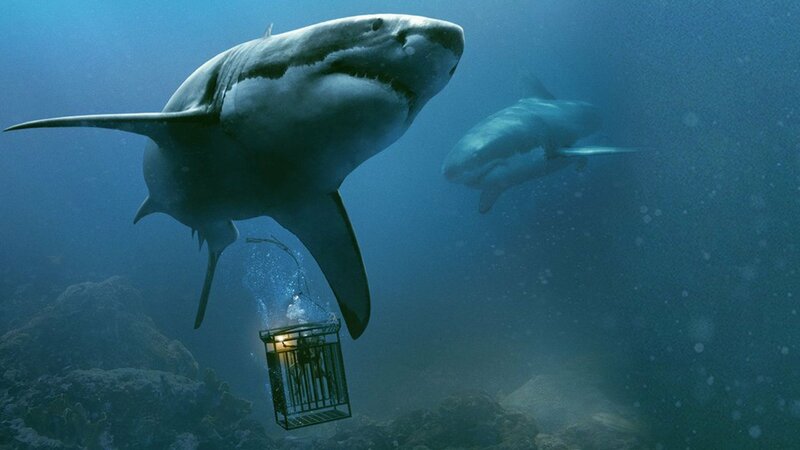 As a premise goes, it is hard to get more hair-raising in terms of sheer claustrophobia than 47 Meters Down – not only do we have two girls, one an inexperienced and fearful diver, trapped in a sea of sharks but trapped inside a steel cage on the sea floor and with their oxygen supplies running out. Just even thinking about this before actually watching the film makes the hairs on one’s neck rise. Certainly, Johannes Roberts and his film crew are operating with far less of a budget than The Shallows – the underwater scenes went no further in terms of location shooting than the UK (which seems an odd fit when the film is supposed to be set in the tropics). The cinematography in The Shallows was ravishing and the entire film lit up by Jaume Collett-Serra’s willingness to experiment with a full arsenal of visual gimmicks; by contrast, the photography in 47 Meters Down looks dank and murky. On the other hand, where The Shallows was filled with cinematic trickery, the lack of it here serves to give 47 Meters Down the feeling of uncomfortable realism. A scene where Mandy Moore hides in the rocks as the shark tries to batter its way to get to her feels very much like it is an actor and a shark actually there. Once he has the two girls imprisoned 47 meters down, Johannes Roberts propels the film into a seat-edge tension within very short course. There is the jolt scene where Claire Holt exits the cage and swims up to get within radio range, only to abruptly encounter the shark and be left swimming for her life back to the safety of the cage. The scene where Claire Holt exits the cage to retrieve the resupply tanks has the real jump-out-of-your-seat scene where the shark abruptly attacks her. It is followed by the incredibly tense scenes where the two sisters must swim up to the surface through waters where sharks are circling and must stop there for five minutes to avoid decompression sickness and with only flares that are running out to hold off the circling sharks. The only downfall of the film is [PLOT SPOILERS] an ending that reveals that last fifteen or so minutes that we have seen have all been a hallucination caused by oxygen deprivation.